What do you get if you take one of the most extreme rally cars of all time, remove all performance restrictions and mix in a collection of high end parts from Forge Motorsport and a whole host of other tuning firms? 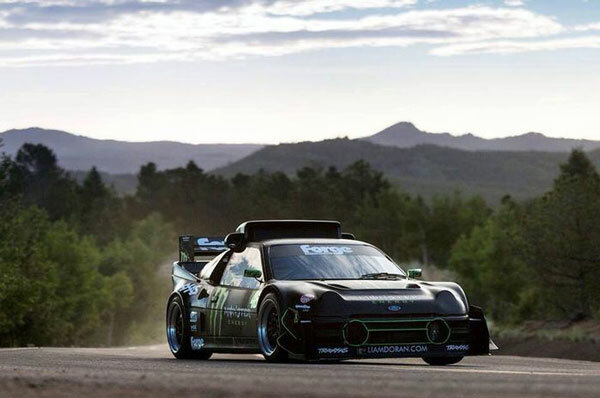 The Monster Energy/Forge Motorsport Ford RS200, that’s what. Owned by the Doran clan, a family best known for their ownership of Lydden Hill and success in Rallycross, this particular RS200 was built for one purpose and one purpose alone – to win the Unlimited Class at Pikes Peak, the ultimate hillclimb prize and an event that’s long been acknowledged as one of the most extreme of its type in world motorsport. The Ford RS200 has passed into petrolhead folklore for a variety of reasons, though the fact that it was prodigiously powerful and incredibly sophisticated for its time certainly helped. Sadly, as was the case with a number of the Group B projects from various car makers, the RS00 was simply too late to the party to make much of an impact. 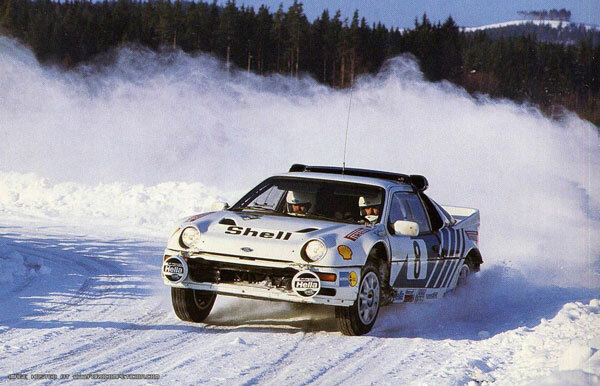 The car made its works debut at the 1986 Swedish Rally with Stig Blomqvist and Kalle Grundel driving, the latter eventually fighting through to finish 3rd. This was to be the car’s best result, a combination of weight, poor reliability and lack of time – Group B was canned in tragic circumstances and Ford pulled out before the end of the year, contributing to a less than stellar top-flight WRC CV. Not that this prevented the RS200 from enjoying an incredible career in Rallycross, and from the late ‘80s to the mid ‘90s it was to be found doing battle with a host of other Group B refugees, namely the Lancia Delta S4, the Audi S1E2 Quattro and the Peugeot 205T16. Rallycross is a bit like World Rallying’s scruffy, slightly un-hinged sibling, the one you wouldn’t trust around matches, so it follows that Pat and Liam’s RS200 was a bit of a weapon before the Pikes Peak assault was mooted, but the nature of project most certainly raised the stakes somewhat! The actual fabrication work was undertaken by Julian Godfrey Engineering, an engineering specialist with a rich history of constructing certifiable fast Fords, with many of the parts supplied by Forge Motorsport. It became apparent that the car would have to be extensively re-worked if it was to ever be competitive at Pikes Peake, a 12.42 mile ascent featuring 156 turns, ultimately climbing to a 14,110ft high summit. Put simply, the task at hand presented far, far more of a challenge than a quick blat around Lydden Hill! A huge array of advanced Forge Motorsport alloy hardware eventually found its way onto the Dagenham bruiser, including a mammoth intercooler and radiator. The former now resides in the centre duct above the roof, right in the path of the airflow and therefore ideally placed for maximum efficiency. Ringing the best part of 925bhp from a relatively small engine obviously involves a whole lot of forced induction wizardry and in turn generates a phenomenal amount of heat, hence why cooling was such a priority for both Forge and the Doran clan when it came to drawing up the car’s spec. The RS200’s iconic BDT E2 was treated to a number of rather drastic modifications in order to render it suitable for the immense task at hand, the most significant being the increase in capacity from 1.8l to a whopping 2.4l. The team at Julian Godfrey Engineering then introduced it to a mammoth Turbonetics turbocharger, one far larger and more advanced than Boreham was ever permitted to use in the car’s works career, plus meatier, more capable BOVs and Wastegates, bespoke Forge boost and intake pipework and, to keep the immense pressures and temperatures in hand, a custom water-meth injection system based around a Forge tank. 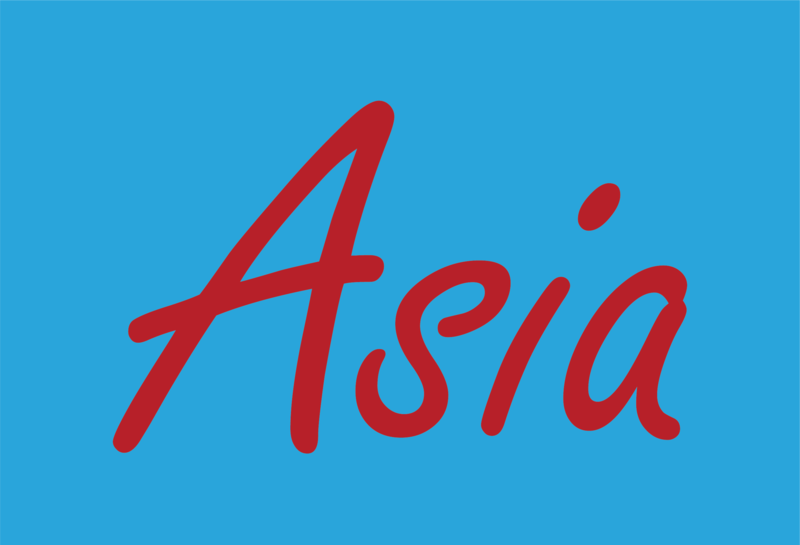 There’s more – much more! Forge’s alloy expertise litters the Doran RS200, a sure sign of the company’s standing within the discerning UK motorsport community. A Forge penned oil cooler now keeps both steering and engine reserves cool enough to function, while a dry sump kit (with Forge designed tank) allows the mighty BDT to slurp its fill of oil at all times, whether or not the car happens to be cornering at a semi-impossible angle halfway up a mountain at the time! Other Forge supplied hardware you might notice include the differential breather tank (as we’ll see, the RS200’s transmission and drivetrain were worked very hard indeed), header and engine breather tanks and water swirl pot. Phew! Forge’s network of engineers also carried out some general repair to the ‘80s bruiser, including a re-manufactured rear exhaust section, a repair to one of the exhaust manifolds and some custom brake ducting, the latter an essential addition considering some of the gut-wrenching drops on the Pikes Peak course. While it’s fair to say that the RS200’s 900bhp-BDT is a bit of a headline grabber, the engine itself must play second fiddle to the way this Group B exile actually looks – straight up terrifying. If ever there was a car set to mug you for your lunch money on the way to school, the Doran RS200 would be it. The collection of aero-sculpted appendages – including the Forge-penned front canards and rear wing extensions, make it look like nothing else on earth, while also helping glue it to the ground when cornering at speed. 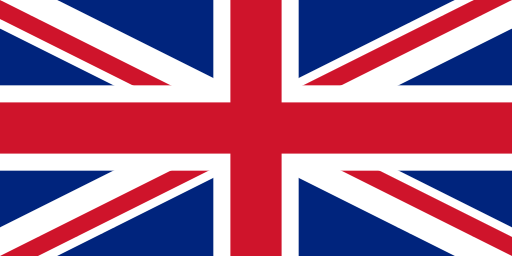 It’s a case of form following function, and it’s all the better for it! So, what happened? Well the freshly built Ford made it to the states in time for the 2012 Race To The Clouds where it was slated to take part in the bill-topping Unlimited class. Pat Doran was the man tasked with hurling the RS200 up the world’s most demanding hill climb in as short a space of time as possible, and he was all set to do it when fate intervened; the car’s gearbox decided it’d had quite enough of functioning correctly and promptly threw in the towel. Finding spares for a European Group B rally car in rural Colorado is, as you can probably imagine, quite a challenge, and this ultimately saw the cancellation of the assault. The team were back at the mountain in 2013 with a revised car, though their bad luck had decided to stick around. The RS200 was fast but tricky to manhandle, and the first run culminated with a scary off for Pat, the rear of the car snapping into oversteer on a tightening right hander. Pat was fine and the damage was light, but it put paid to the run. The team went back to the bottom of the hill to lick their wounds and assess the damage, and were able to rebuild the car within a matter of hours and with much frantic spannering. This mammoth team effort was enough to see the somewhat bedraggled RS200 back in one piece before the end of the weekend, in turn meaning Pat could have another assault. This went a lot more smoothly, the Englishman crossing the line in 10 minutes and 14 seconds, good enough for 6th place overall. 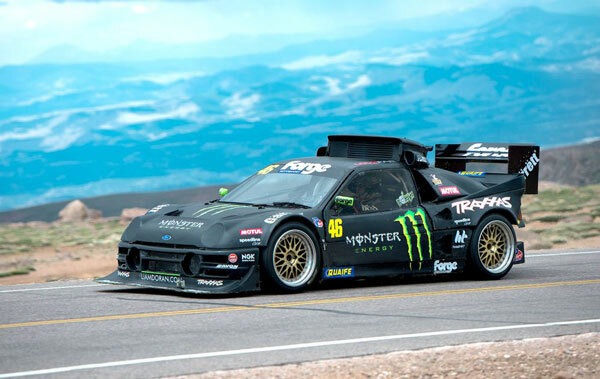 No mean feat for a first trip to Pikes Peak in a hastily rebuilt, 30-odd year old Ford! Teething troubles and misfortune aside, this RS200 remains one of the most rewarding projects Forge has had the pleasure of being involved with, and there’s no doubt that Pat and Liam Doran will be back at Pikes Peak at a latter date – they’ve unfinished business!